In Saint-Pardoux, the summers are comfortable and partly cloudy and the winters are very cold, windy, and mostly cloudy. Over the course of the year, the temperature typically varies from 34°F to 76°F and is rarely below 24°F or above 87°F. Based on the tourism score, the best time of year to visit Saint-Pardoux for warm-weather activities is from late June to early September. Click on each chart for more information. The warm season lasts for 3.2 months, from June 10 to September 15, with an average daily high temperature above 70°F. The hottest day of the year is August 3, with an average high of 76°F and low of 56°F. The cool season lasts for 3.6 months, from November 18 to March 6, with an average daily high temperature below 51°F. The coldest day of the year is February 8, with an average low of 34°F and high of 46°F. The figure below shows you a compact characterization of the entire year of hourly average temperatures. The horizontal axis is the day of the year, the vertical axis is the hour of the day, and the color is the average temperature for that hour and day. Ravensdale, Washington, United States (5,061 miles away) is the far-away foreign place with temperatures most similar to Saint-Pardoux (view comparison). In Saint-Pardoux, the average percentage of the sky covered by clouds experiences significant seasonal variation over the course of the year. The clearer part of the year in Saint-Pardoux begins around May 22 and lasts for 4.6 months, ending around October 10. On July 24, the clearest day of the year, the sky is clear, mostly clear, or partly cloudy 69% of the time, and overcast or mostly cloudy 31% of the time. The cloudier part of the year begins around October 10 and lasts for 7.4 months, ending around May 22. On January 5, the cloudiest day of the year, the sky is overcast or mostly cloudy 71% of the time, and clear, mostly clear, or partly cloudy 29% of the time. A wet day is one with at least 0.04 inches of liquid or liquid-equivalent precipitation. The chance of wet days in Saint-Pardoux varies throughout the year. The wetter season lasts 8.3 months, from September 24 to June 4, with a greater than 25% chance of a given day being a wet day. The chance of a wet day peaks at 34% on December 30. The drier season lasts 3.7 months, from June 4 to September 24. The smallest chance of a wet day is 16% on August 25. Among wet days, we distinguish between those that experience rain alone, snow alone, or a mixture of the two. Based on this categorization, the most common form of precipitation throughout the year is rain alone, with a peak probability of 33% on November 3. To show variation within the months and not just the monthly totals, we show the rainfall accumulated over a sliding 31-day period centered around each day of the year. Saint-Pardoux experiences some seasonal variation in monthly rainfall. Rain falls throughout the year in Saint-Pardoux. The most rain falls during the 31 days centered around October 29, with an average total accumulation of 2.5 inches. The least rain falls around August 15, with an average total accumulation of 1.2 inches. The length of the day in Saint-Pardoux varies significantly over the course of the year. In 2019, the shortest day is December 22, with 8 hours, 34 minutes of daylight; the longest day is June 21, with 15 hours, 50 minutes of daylight. The earliest sunrise is at 6:07 AM on June 16, and the latest sunrise is 2 hours, 38 minutes later at 8:45 AM on January 1. The earliest sunset is at 5:13 PM on December 11, and the latest sunset is 4 hours, 45 minutes later at 9:58 PM on June 26. Daylight saving time (DST) is observed in Saint-Pardoux during 2019, starting in the spring on March 31, lasting 6.9 months, and ending in the fall on October 27. The solar day over the course of the year 2019. From bottom to top, the black lines are the previous solar midnight, sunrise, solar noon, sunset, and the next solar midnight. The day, twilights (civil, nautical, and astronomical), and night are indicated by the color bands from yellow to gray. The transitions to and from daylight saving time are indicated by the 'DST' labels. The perceived humidity level in Saint-Pardoux, as measured by the percentage of time in which the humidity comfort level is muggy, oppressive, or miserable, does not vary significantly over the course of the year, staying within 3% of 3% throughout. The average hourly wind speed in Saint-Pardoux experiences significant seasonal variation over the course of the year. The windier part of the year lasts for 6.7 months, from October 8 to April 28, with average wind speeds of more than 9.6 miles per hour. The windiest day of the year is January 16, with an average hourly wind speed of 11.1 miles per hour. The calmer time of year lasts for 5.4 months, from April 28 to October 8. The calmest day of the year is August 5, with an average hourly wind speed of 8.0 miles per hour. The predominant average hourly wind direction in Saint-Pardoux varies throughout the year. The wind is most often from the west for 8.1 months, from February 1 to October 3, with a peak percentage of 46% on July 6. The wind is most often from the south for 3.9 months, from October 3 to February 1, with a peak percentage of 37% on January 1. Saint-Pardoux is located near a large body of water (e.g., ocean, sea, or large lake). This section reports on the wide-area average surface temperature of that water. The average water temperature experiences some seasonal variation over the course of the year. The time of year with warmer water lasts for 3.2 months, from June 24 to September 29, with an average temperature above 64°F. The day of the year with the warmest water is August 10, with an average temperature of 68°F. The time of year with cooler water lasts for 3.9 months, from December 16 to April 11, with an average temperature below 53°F. The day of the year with the coolest water is February 17, with an average temperature of 49°F. To characterize how pleasant the weather is in Saint-Pardoux throughout the year, we compute two travel scores. The tourism score favors clear, rainless days with perceived temperatures between 65°F and 80°F. Based on this score, the best time of year to visit Saint-Pardoux for general outdoor tourist activities is from late June to early September, with a peak score in the third week of July. The tourism score (filled area), and its constituents: the temperature score (red line), the cloud cover score (blue line), and the precipitation score (green line). The beach/pool score favors clear, rainless days with perceived temperatures between 75°F and 90°F. Based on this score, the best time of year to visit Saint-Pardoux for hot-weather activities is from mid July to mid August, with a peak score in the first week of August. The beach/pool score (filled area), and its constituents: the temperature score (red line), the cloud cover score (blue line), and the precipitation score (green line). For each hour between 8:00 AM and 9:00 PM of each day in the analysis period (1980 to 2016), independent scores are computed for perceived temperature, cloud cover, and total precipitation. Those scores are combined into a single hourly composite score, which is then aggregated into days, averaged over all the years in the analysis period, and smoothed. Our cloud cover score is 10 for fully clear skies, falling linearly to 9 for mostly clear skies, and to 1 for fully overcast skies. Our precipitation score, which is based on the three-hour precipitation centered on the hour in question, is 10 for no precipitation, falling linearly to 9 for trace precipitation, and to 0 for 0.04 inches of precipitation or more. Our tourism temperature score is 0 for perceived temperatures below 50°F, rising linearly to 9 for 65°F, to 10 for 75°F, falling linearly to 9 for 80°F, and to 1 for 90°F or hotter. Our beach/pool temperature score is 0 for perceived temperatures below 65°F, rising linearly to 9 for 75°F, to 10 for 82°F, falling linearly to 9 for 90°F, and to 1 for 100°F or hotter. The growing season in Saint-Pardoux typically lasts for 7.0 months (215 days), from around April 9 to around November 9, rarely starting before March 19 or after April 28, and rarely ending before October 18 or after December 16. Based on growing degree days alone, the first spring blooms in Saint-Pardoux should appear around April 13, only rarely appearing before March 28 or after April 29. The average growing degree days accumulated over the course of the year, with 25th to 75th and 10th to 90th percentile bands. The average daily incident shortwave solar energy experiences extreme seasonal variation over the course of the year. The brighter period of the year lasts for 3.3 months, from May 11 to August 22, with an average daily incident shortwave energy per square meter above 5.8 kWh. The brightest day of the year is July 7, with an average of 7.0 kWh. The darker period of the year lasts for 3.7 months, from October 28 to February 17, with an average daily incident shortwave energy per square meter below 2.2 kWh. The darkest day of the year is December 27, with an average of 1.0 kWh. For the purposes of this report, the geographical coordinates of Saint-Pardoux are 46.572 deg latitude, -0.305 deg longitude, and 646 ft elevation. The topography within 2 miles of Saint-Pardoux contains only modest variations in elevation, with a maximum elevation change of 262 feet and an average elevation above sea level of 639 feet. Within 10 miles contains only modest variations in elevation (741 feet). Within 50 miles contains significant variations in elevation (984 feet). The area within 2 miles of Saint-Pardoux is covered by grassland (55%) and cropland (42%), within 10 miles by cropland (55%) and grassland (35%), and within 50 miles by cropland (72%) and grassland (13%). This report illustrates the typical weather in Saint-Pardoux, based on a statistical analysis of historical hourly weather reports and model reconstructions from January 1, 1980 to December 31, 2016. There are 4 weather stations near enough to contribute to our estimation of the temperature and dew point in Saint-Pardoux. For each station, the records are corrected for the elevation difference between that station and Saint-Pardoux according to the International Standard Atmosphere , and by the relative change present in the MERRA-2 satellite-era reanalysis between the two locations. The estimated value at Saint-Pardoux is computed as the weighted average of the individual contributions from each station, with weights proportional to the inverse of the distance between Saint-Pardoux and a given station. 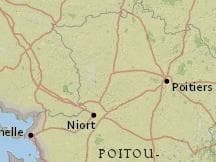 The stations contributing to this reconstruction are: Niort-Souché (50%, 30 kilometers, south); Poitiers–Biard Airport (29%, 47 kilometers, east); La Roche-sur-Yon - Les Ajoncs (12%, 83 kilometers, west); and Angers-Avrillé (9%, 104 kilometers, north).